A two-minute date with American Airlines will end very, very well. By participating in the airline's new "Learn and Earn" promotion, you can get 1,000 free AAdvantage miles just by watching a few videos and pushing a few buttons. No purchases necessary, no catch. And you can just skip through the videos, anyway. As an extra perk, the airline will enter you into a drawing for two First Class, round-trip tickets to a destination of your choice. 1. Go to the Learn and Earn promotion page and enter your dream destination. 2. 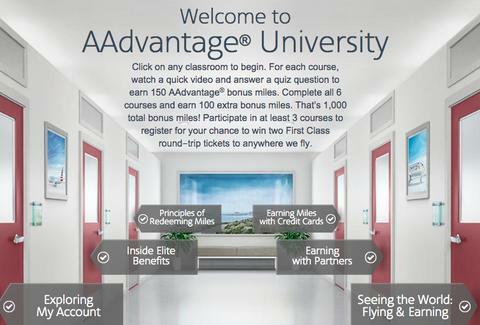 Click on each of the six doors of "AAdvantage University"
3. Fast forward to the end of each video. Or watch them, if you're really bored. 4. Answer one question at the end of each video. That’s it. Videos range from about one to two minutes in length. But you can get through all the doors in two minutes or less by fast-forwarding to the end and getting straight to the question. You get 150 AAdvantage miles for each answer, regardless of correct answers. When it’s all over, enter your name, email address, and AAdvantage number to get those miles and be entered into the contest. Obviously, you need a rewards account to claim the miles. And remember, the promotion ends on June 12, 2015. Miles should be awarded to participating accounts about eight weeks after the end of the promotion period, and only those residing in the good ol’ USA are eligible. Sorry out-of-towners.